Welcome to the SU Website! Thanks for Visiting! Our Mission Streator Unlimited, Inc. is committed to enriching the lives of adults with disabilities by teaching skills that will enable them to reach their fullest potential, live as independently as possible, and become integrated into the community. Begun in 1965 by a group of community leaders and family members, Streator Unlimited has grown to offer vocational training and residential services in six locations within the Streator Area. We are 401(C)(3) nonprofit with an 11-person volunteer Board of Directors. Here is Streator Unlimited in one page. 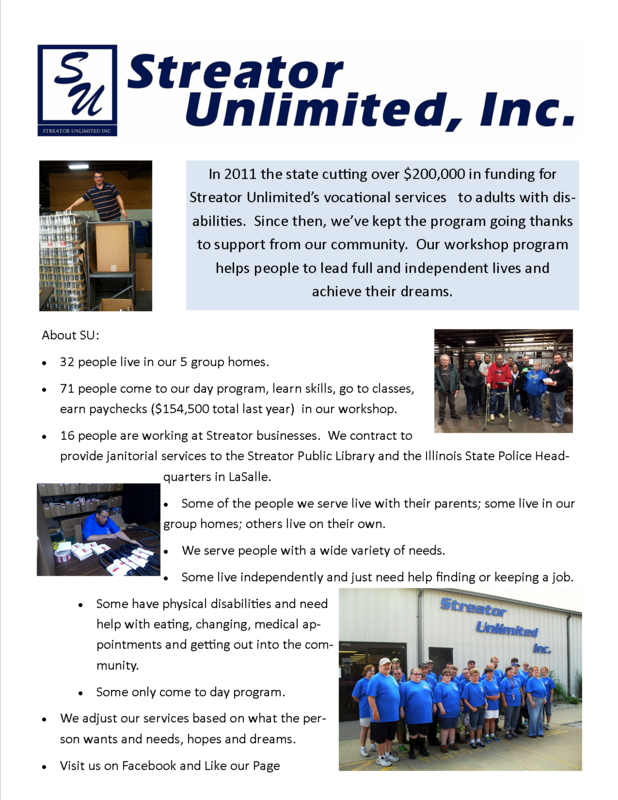 Streator Unlimited is funded to provide services by the Illinois Department of Human Services, the LaSalle County Mental Health Board, subcontract work, the Streator Area United Way, and donations/fundraisers.